Portmeirion Group PLC is a British company selling ceramic tableware, cookware, giftware, glassware, home fragrance products and associated housewares worldwide. Portmeirion Group PLC is headquarted in Stoke-on-Trent and listed on the Alternative Investment Market (AIM) of the London Stock Exchange. Tenth consecutive year of record Group revenue in 2018, which increased by 5.7% to £89.6 million. Our five unique and established homeware and fragrance brands have nearly 700 years of collective life: Portmeirion, Spode, Wax Lyrical, Royal Worcester and Pimpernel. Our corporate website contains a wealth of information for current and potential investors, such as annual report and accounts, investor presentations and up-to-date share price data. 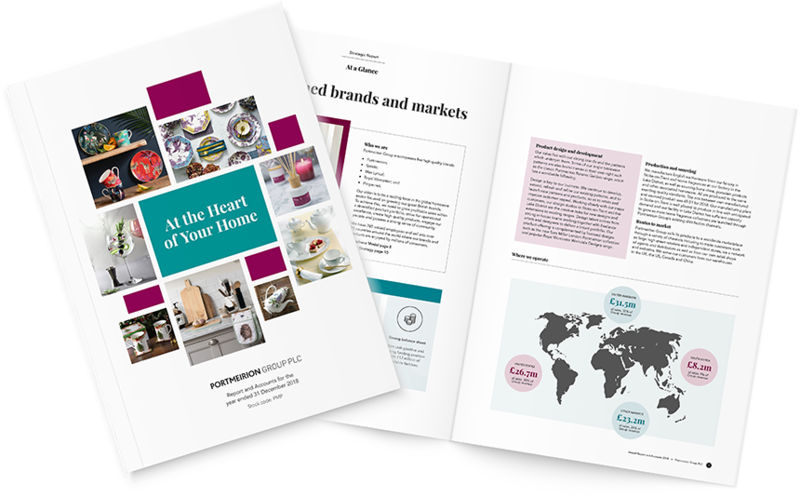 Portmeirion Group PLC is an AIM-listed leading global homewares group encompassing five high quality heritage brands and a consistent track record of growth. The Group has nearly 800 employees across the world. We believe that our people are our greatest asset and the Group’s success is directly related to the effectiveness of our people. Come and join our teams!